buying a cabin in the Smoky Mountains? Are you considering buying a cabin to use as a vacation home? Have you considered whether or not it’s a good investment? Do you just want a place to go, relax and enjoy when you get a chance or maybe a place to spend the summer. Maybe you want a place to go in the winter where you can ski and do other winter activities. Whatever your reasoning or thoughts may be it can be tempting to consider the purchase of a cabin. You can always rent it out when you’re not using it, right? That can help the mortgage costs for sure. Before you take the plunge, there are things you need to ask yourself. 1. Where is a good place to buy? You’ve enjoyed the area where you’d like to buy and now you want to make it permanent. Nothing wrong with wanting a long-term commitment and wanting to settle down and make a life there. – How will I get there? You should consider how often you plan to visit, because that’s going to be a factor in determining where you buy. More than half of cabin owners buy their vacation home within fifty miles of their residence. Approximately eighty percent buy it somewhere within driving distance. Sure, you might have enjoyed that trip to Costa Rica, but you’re not going to be able to go there on a three-day vacation whenever you’d like. – Will I need rental income? National Association of Realtors show that most people don’t put their vacation homes on short term rental programs. However, if you need the rental income to help make the mortgage payments, you might want to choose a place that’s in a very desirable location. That includes near oceans, lakes, rivers, or in mountain recreational areas, such as Gatlinburg, Tennessee. – Will the location fit my future lifestyle? It’s true that many vacation homes can actually gain value overtime, but the National Association of Realtorssuggests that short-term speculation on vacation real estate can be a tricky business. Most buyers decide on a place they’re planning on using for many years to come. If you plan for long-term enjoyment, that means you need to buy a place that’s big enough for a future family, or choosing an area with a wide selection of recreational opportunities that will help to accommodate any future or currently evolving interests. It could be that mountain biking is your current passion. What happens when you decide to trade that bike in for some golf clubs? What if you decide you enjoy fishing more than hiking? You also want to consider the implications of long-term retirement. If you’re going to live there permanently after you retire from your career, you want to make sure that the location is comfortable for seniors. In later years, are you really going to want to climb up stairs if you decide you want a place that’s master bedroom is on the top floor? Will you really want to have to drive down a dirt road if you choose a more rural, rustic cabin? 2. Can I afford a second home? It’s very important for you to sit down and take a good long look at your finances before deciding to go through with the purchase of a vacation home? If you don’t, there’s a good chance that your dream cabin will become your worst nightmare. Don’t just look at the purchase, there’s a lot more to consider when you purchase a vacation home. – What’s the financing like? The first thing is find out what kind of financing offer you can get. Mortgage companies are known for charging higher interest rates and larger down payments for second homes. There are ways, of course, to finance your cabin without breaking into your kid’s college fund. You can leverage the equity in your primary residence, or even divert pretax funds from the IRA. With the overwhelming array of financing options available, we would advised you to ask for help from a mortgage professional instead of just doing it all yourself. You may absolutely love the location of your new vacation home, but you need to be aware of the flip side of that coin. Those adorable little vacation communities also, just likje many other places, have a risk of natural disasters such as floods, hurricanes, and forest fires. So you’ll need insurance, and that insurance can often leave your budget in the dumps. Don’t get unpleasant surprises during the purchase process; get several insurance quotes before you even make an offer. Trust me, this will save you in the long run. Buyers sometimes don’t consider the maintenance cost associated with a vacation home, especially things like roof repairs or replacements, HVAC, exterior paint and other big ticket maintenance items. However, you should probably set aside about two percent of the house’s value each year just for maintenance alone. If you’re using a professional property rental management company, it’s a good idea to expect them to take anywhere from twenty to forty percent of the gross rental income, because they’re going to be doing most of the work involved. 3. Am I making a smart investment? Certain numbers from the National Association of Realtors show a trend that’s going upward in the number of vacation homes purchased solely for investment purposes. Rental properties far outnumber vacation homes by a wide margin. Of course, property values DO fluctuate, but according to Tom Kelly, who co-wrote How a Second Home Can Be Your Best Investment, sinking a large portion of your total net worth into a residential home can be a good way to get variety in your portfolio. Just like all investments, Kelly adds, you must pay attention to what you’re buying. Before you make any sort o offer, put down your rose-colored glasses and learn everything possible about local zoning laws, construction standards, development plans, and any other factors that might negatively affect the long-term aspect of your investment on the cabin you plan on buying. 4. How will a second home affect my taxes? Much like your current home, a vacation cabin is likely to have a huge impact when tax season comes around. According to National Association of Tax Professionals, mortgage interest and property taxes on both primary and vacation homes alike can be claimed as Schedule A deductions. So in order to avoid negative interactions with the IRS, you should be knowledgeable of some major differences in how vacation cabins are taxed. The NATP will advise you that homes rented out for less than fifteen days a year are considered to be personal use property by the IRS. You are not required to report your rental income as actual income, and no other deductions (other than from mortgage interest and property taxes) are allowed. If, however, you decide you do want to rent your cabin for more than fifteen days a year, you should be prepared for all the paperwork that will come, beginning with the requirement that all rental receipts must reported to the IRS as a form of income. The NATP additionally adds other expenses such as your utilities, any repairs that might pop up, the monthly insurance premiums, and rental management fees can be deducted against the income you get from your cabin home. You might be able to cover travel expenses used for maintaining the property as well, but not for any property rented out for fewer than a total of fifteen days annually. 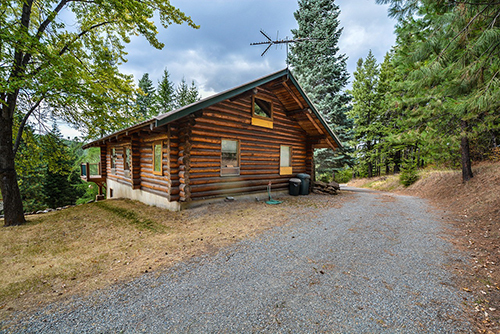 Other than your primary residence, any profits from the sale of the vacation cabin will be taxed as capital gain. It might be possible for you to make a end run avoiding capital gains tax if you decide to move into your vacation home and stay there for at least two years before selling. 5. Should I look into time shares or joint ownership? Time shares have gotten a bad rap over the years due to shady business dealings and pushy sales tactics. However, recently, the industry has worked hard to turn over a new leaf, and people are much more satisfied than before with how their time shares work. There are actually two different things that both fall under the umbrella of the term ‘time share’. In some instances, buyers receive a deed to the property that allows them ownership of a house or condominium for specific times of the year. In other instances, you buy specific times at a resort but do not actually hold a deed to the property. No matter which way you go, time share owners must pay annual maintenance fees to a rental management company. Most of the contracts will allow you to trade in your time at your vacation home for time at another destination. Just like homes, time shares can be sold if you grow tired of it. However, it is warned that you typically receive far less than what you paid for it. So keep that in mind if you suddenly have a change of heart, because the loss could really hit you hard. The Federal Trade Commission also warns buyers to never, ever sign a time share contract before carefully looking through all the different obligations and benefits. That being said, if you shop carefully and take the time to read the fine print, time shares can be a great way to pay upfront for your future vacations. Another form of joint ownership is that you buy a vacation property with one of your friends or with a relative. This can cut down on cost for everyone and you’ll be able to better coordinate when people are using the cabin and how often each of you gets to use it. Just make sure that even if you’re jointly owning it with a friend or family member that you carefully go over the contract and make sure all the details are in place just in case one of you wants out of the deal. After all is said and done, if you can afford a vacation home, Great! There’s nothing quite like relaxing in a giant hot tub, or stretching out on a lawn chair and admiring a picturesque view. If you enjoy fishing, or golfing, or other attractions, than you should look for and find the perfect rental property to suit your lifestyle. Good luck and happy house hunting!